The plant Foeniculum vulgare (1). From the Middle English fenel, from the late 古期英語 finuðl, finule (weak feminine forms); fenol, finul (masculine forms), from Old French fenoil, from the Vulgar Latin *fēnuclum, fēnoclum, from Late Latin fēnuculum, from the Classical Latin faeniculum, a diminutive form of faenum (“hay”); compare the Italian finocchio, the Occitan fenolh, the French fenouil, and the Spanish hinojo. Doublet of finocchio. A plant, Foeniculum vulgare, of the parsley family, which has a sweet, anise-like flavor. (cooking) The bulb, leaves, or stalks of the plant, eaten as a vegetable. 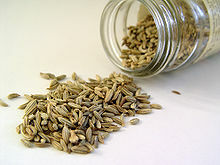 (cooking) The seeds of the fennel plant used as a spice in cooking. Fennel (Foeniculum vulgare) is a plant species in the genus Foeniculum (treated as the sole species in the genus by most botanists). It is a member of the family Apiaceae (formerly the Umbelliferae). It is a hardy, perennial, umbelliferous herb, with yellow flowers and feathery leaves. It is generally considered indigenous to the shores of the Mediterranean, but has become widely naturalised in many parts of the world, especially on dry soils near the sea-coast and on riverbanks.